Cristina Alger is the author of the new novel The Banker's Wife. She also has written the novels The Darlings and This Was Not the Plan. She has worked as a financial analyst and a corporate attorney, and she lives in New York. Q: How did you come up with the idea for The Banker’s Wife? A: I was inspired by two news stories that came out around the same time, both having to do with offshore banking (the bigger of the two being the Panama Papers). I've always found offshore banking mysterious and fascinating and fertile ground for a novel. And I loved the character of Marina (from my first novel, The Darlings) - and I knew she'd be the perfect protagonist for this kind of story. Q: The novel switches among several characters' perspectives. Did you write the book in the order in which it appears, or did you focus more on one character before turning to another? A: I wrote it in the order it appears. I had to be very careful about the timeline so it didn't get confusing - and I was conscious of alternating chapter to chapter to give each story line equal weight. 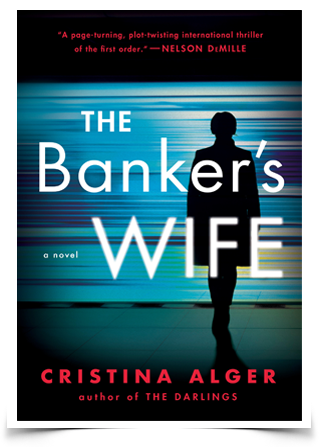 A: Both protagonists are banker's wives (one is a banker's fiancé, but still). Both are women who are really struggling with maintaining their own identity while also being married to successful men. So I thought it was a nice way to tie the two stories together. A: Tom Wolfe, Dominick Dunne, Truman Capote, Nelson DeMille, Lee Child, Amor Towles, Janice Lee, Alafair Burke...I could go on for a while! A: A thriller set on Long Island that revolves around a series of interlinked murders of young women. A: It was really important to me to write a novel that celebrated strong, intelligent women. For the past year, I've tried to read more work by female authors, and more work that features female protagonists. It's more important than ever!